Barbecue. There’s the easy way — and the right way. I understand easy — you don’t always want to stand over a smoker for 6 hours in 96° heat. 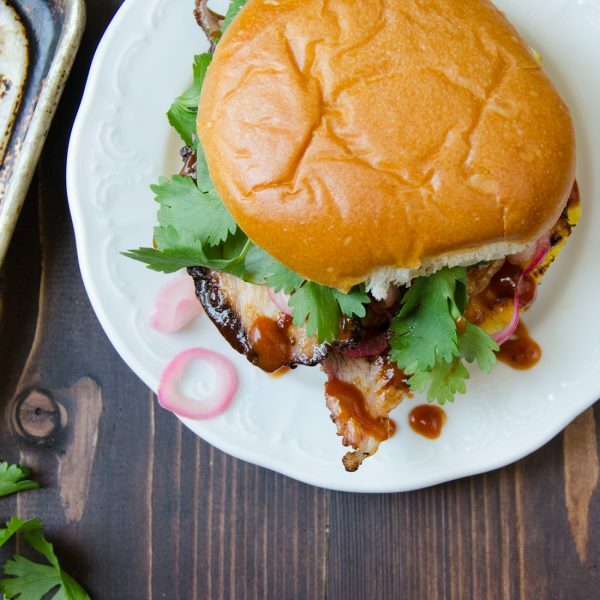 For those who prefer simplicity, I’ve got a delicious hands-off recipe that’s always a hit. For those who want accolade, admiration and the moniker “Pit-Master”, this one is for you. This long Labor Day weekend started off with a big package of pork spareribs as the star. We arrived at my parent’s place in Key Largo on Friday night. After a dip in the pool and a guava cocktail, the conversation turned to what we were were “having” this weekend. Scott was prepared, having loaded his Weber smoker in the back of the SUV. We were having ribs. 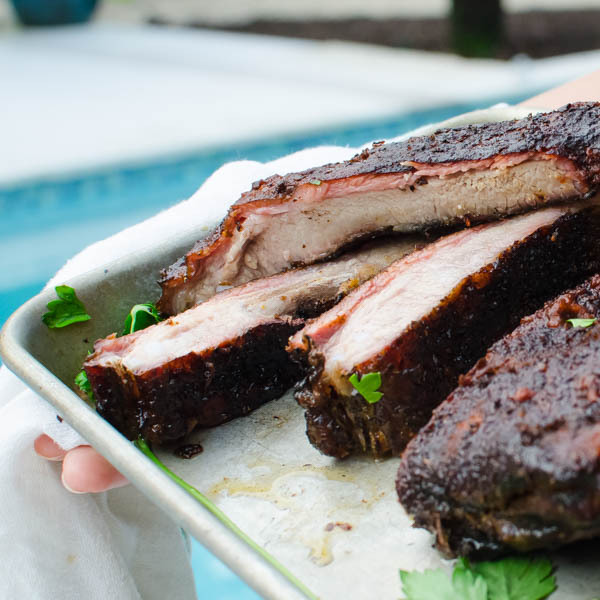 Spice-rubbed, slow-smoked, lovingly-tended ribs. This tends to be an all-day endeavor, but as long as there’s cold drinks and (hopefully) a pool, it’ll be temperate enough that it won’t be a complete sweat-fest. 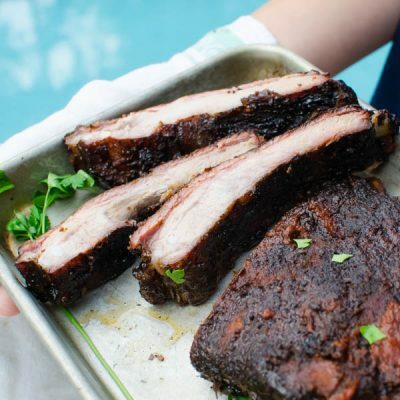 After rubbing the ribs with the spice blend (and letting it rest for at least a few hours or overnight), get the smoker going by bringing the coals to a fiery gray ember and adding soaked hickory wood chips. 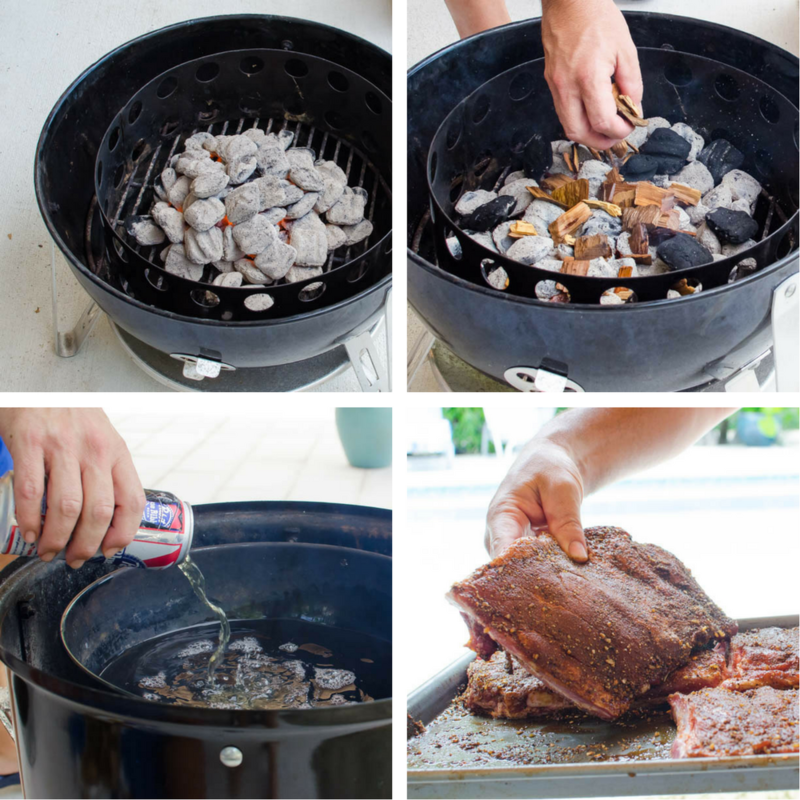 Fill the water pan with water — or do like Scott and add a few cans of beer. 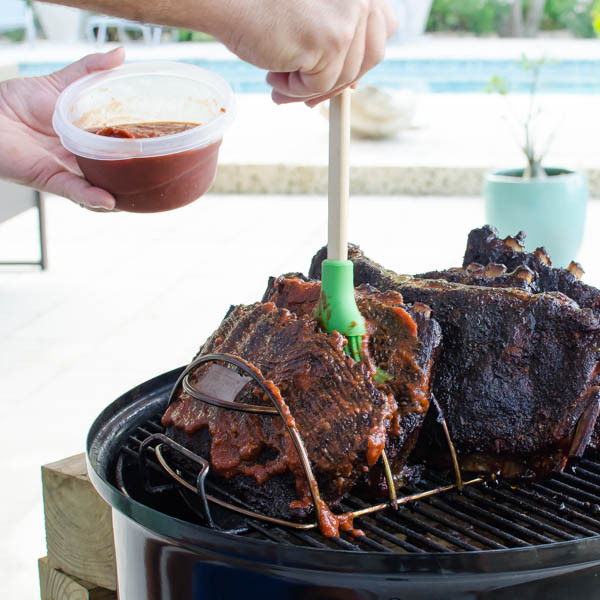 A rib rack will hold the ribs upright and allow you to smoke more meat at once. 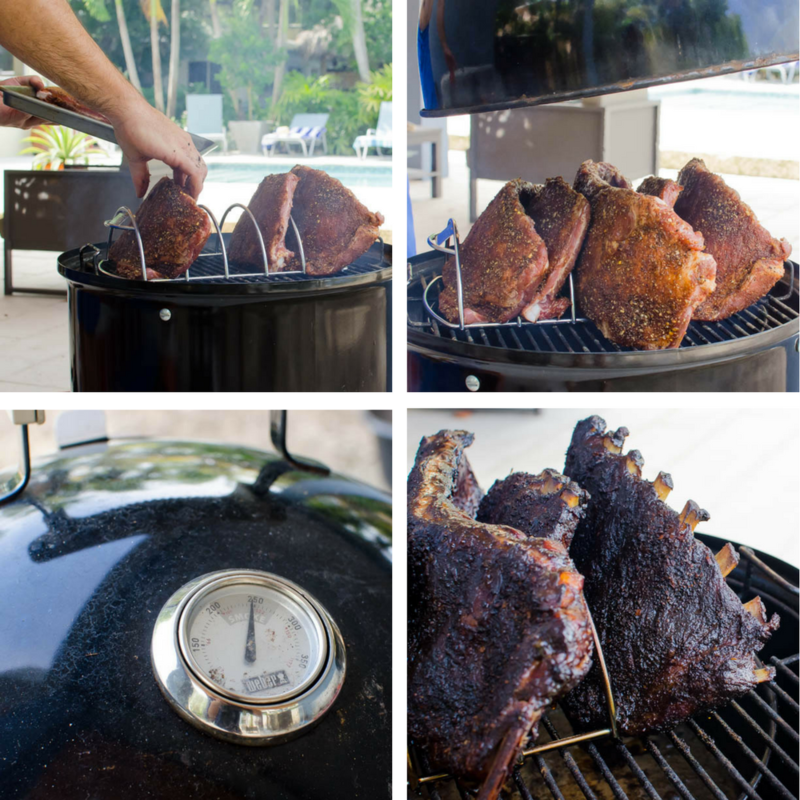 Then the key is to put the lid on the smoker and hold the heat steady at 225°- 250° for 4-5 hours. Do not remove the lid, otherwise you lose the heat. Scott moderated the heat through the side door throughout the afternoon. Tossing in more charcoal and wood chips as needed and opening (or closing) the vents to adjust things one way or another. 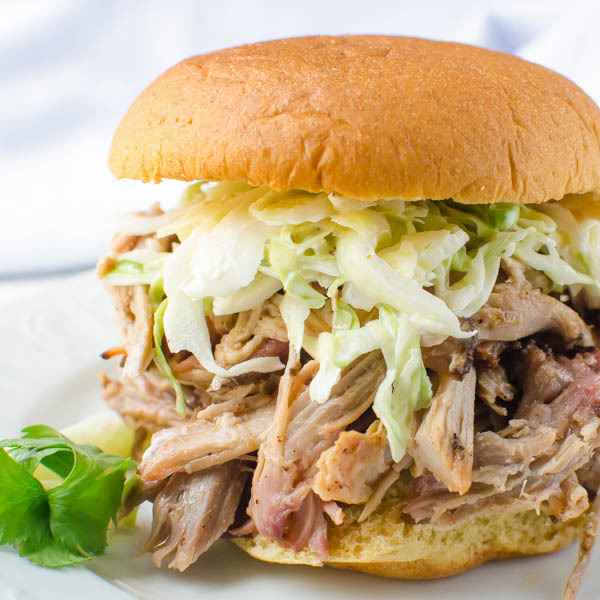 Look at that smoky bark! He brushed my Mom’s guava barbecue sauce (I know – guava seems to be a pervasive thing with us right now!) over the racks to lacquer the meat. By this point, the rest of the family was hovering around the pit like bees to honey. 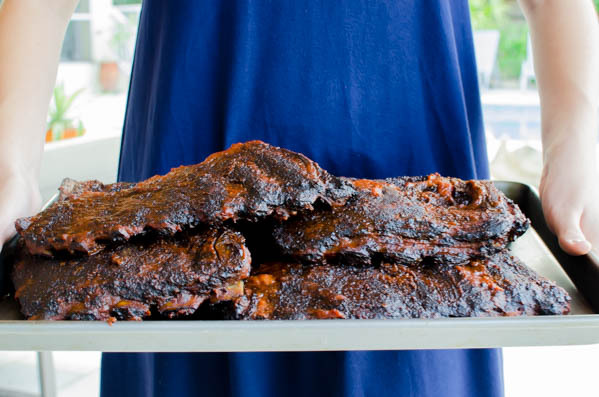 My cousin Francesca was only happy to hold the tray while Scott loaded it with the smoky ribs. She claimed this bit for herself — and I don’t blame her! Check out that gorgeous pink-hued hickory smoke ring. That’s flavor my friends! An all day endeavor - that's so worth it! Combine all the ingredients for the rub in a small bowl. Remove the ribs from the package and pat dry with paper towels. Trim the silver skin from the ribs by using a very sharp knife to separate the silver skin from the ribs. Once you have a good sized tab, pull the silver skin from the ribs and discard. 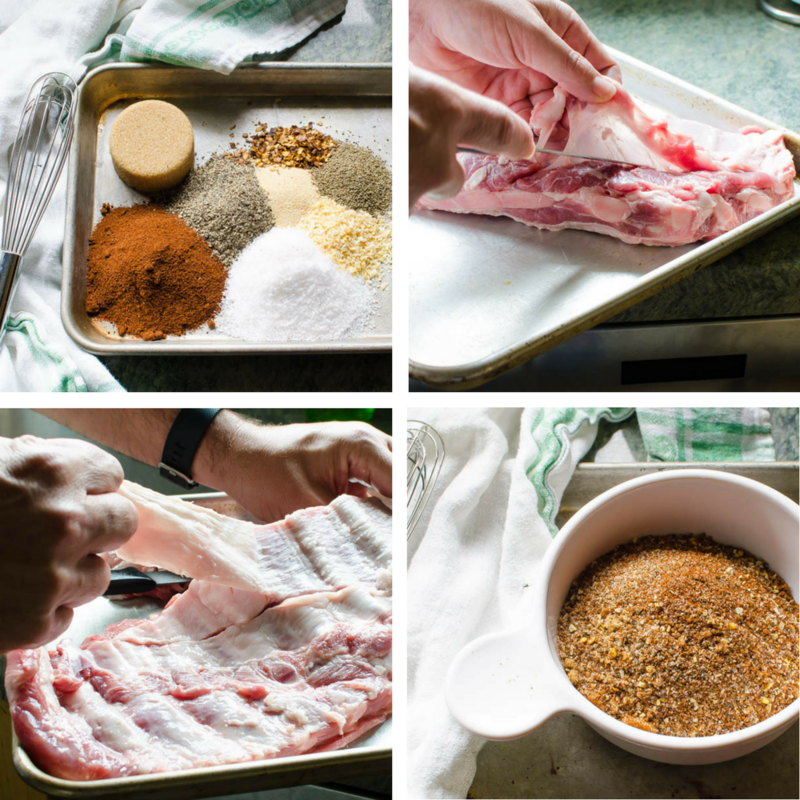 Liberally coat the ribs on both sides with the rub and press into the flesh. Cover and refrigerate 6 hours or overnight. Soak approximately 3 cups of hickory wood chips in water for an hour. Set up the water smoker for indirect heat according to your manufacturer's instructions. Arrange charcoal briquettes in a small mound and light. Wait until the embers are ashy and the fire is hot, then sprinkle the briquets with one or two handfuls of wood chips. Set the water pan on the grate above the heat. Fill 2/3 with water and 1 or 2 beers (optional). 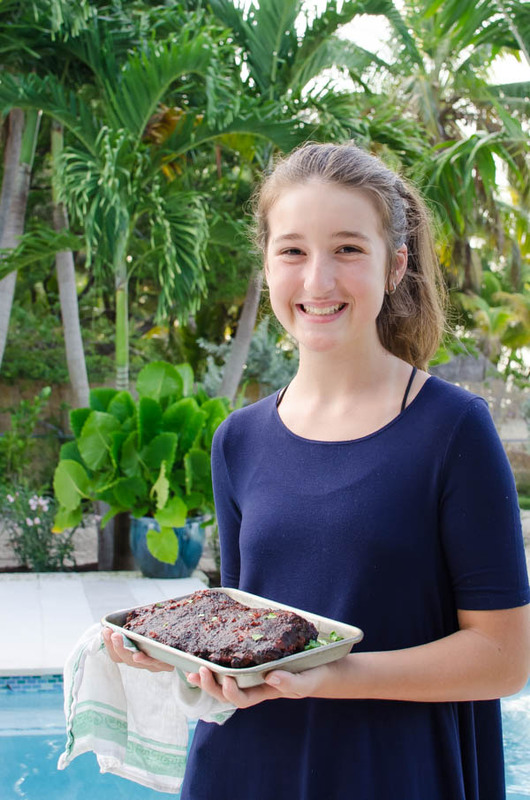 Put the lid on the smoker and maintain the temperature between 225° - 250° for 4-5 hours, depending on the size and quantity of the ribs. 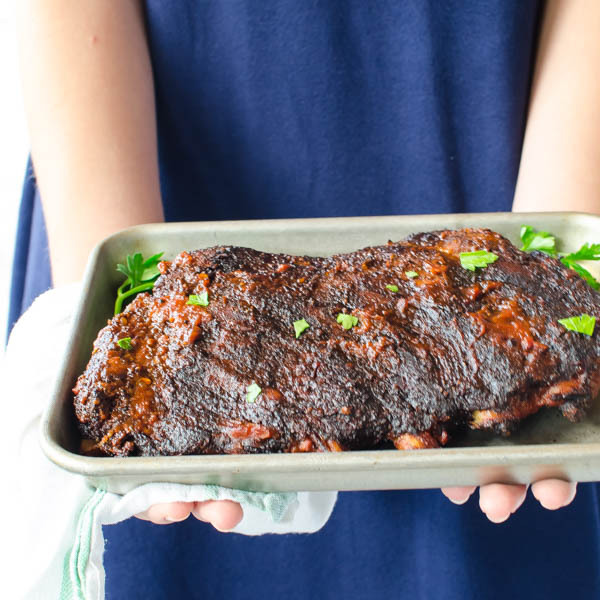 You'll know when they're done when the ribs pull back from the bone, but avoid the temptation to look early on in the process as that will reduce the temperature and will take that much longer to get it where it needs to be. 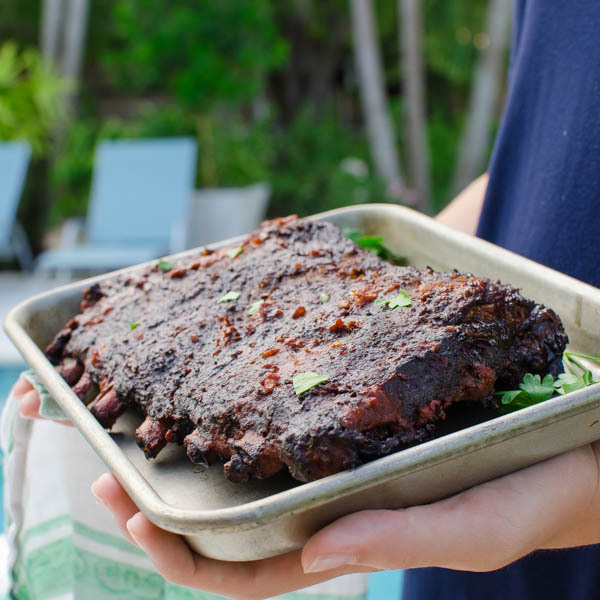 When the ribs are cooked through, brush with your favorite barbecue sauce and cook 10-15 minutes until lacquered. 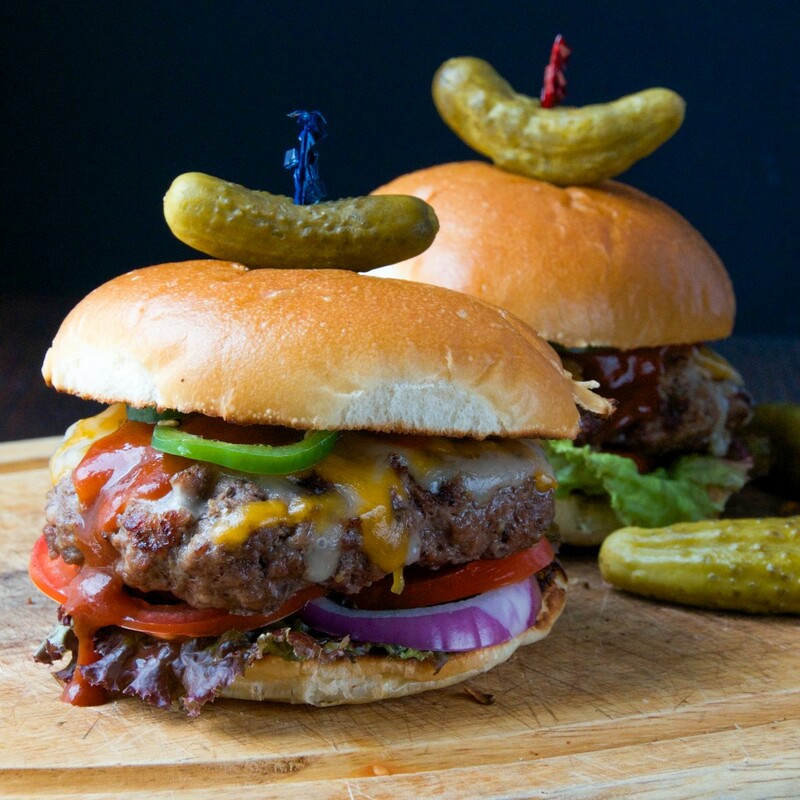 Enjoy with cold beers or your favorite summer wine. I love your step by step photos…so cute your daughter was able to help :-). 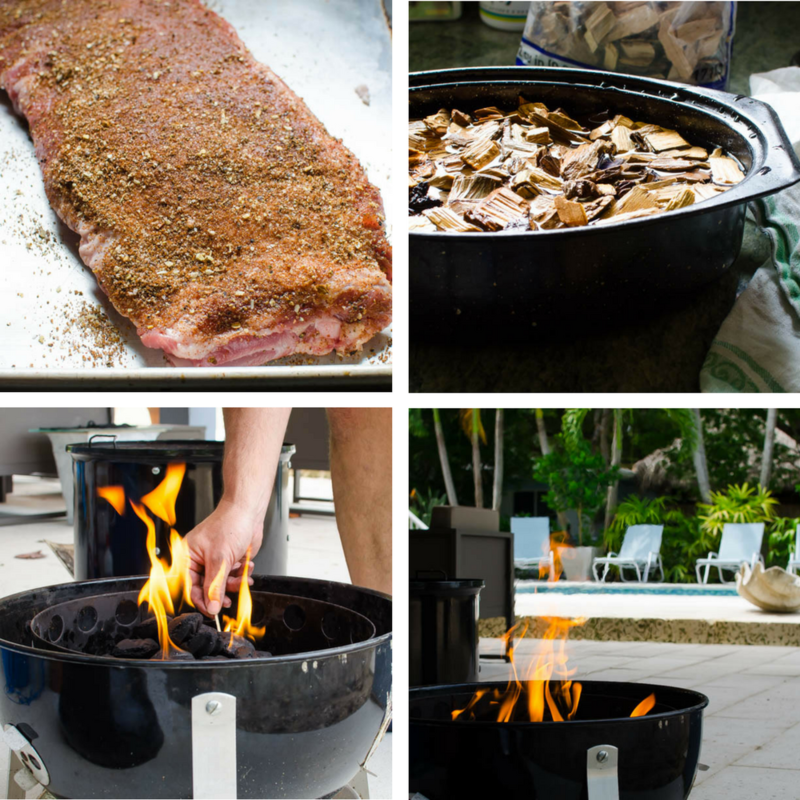 Great instructions on how to set up for grilling and that rub sounds amazing. Francesca is so sweet! 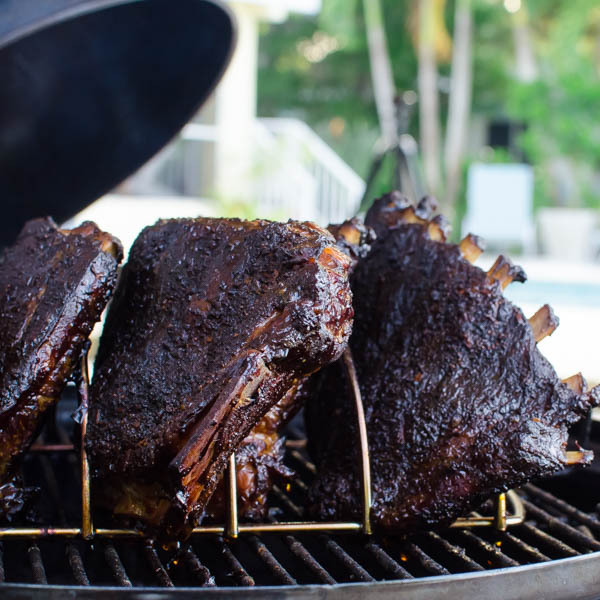 I love ribs and these one looks simply incredible! Yum I love smoking ribs! There is no other way to eat them! I love that rack you have for the smoker! Oh wow! 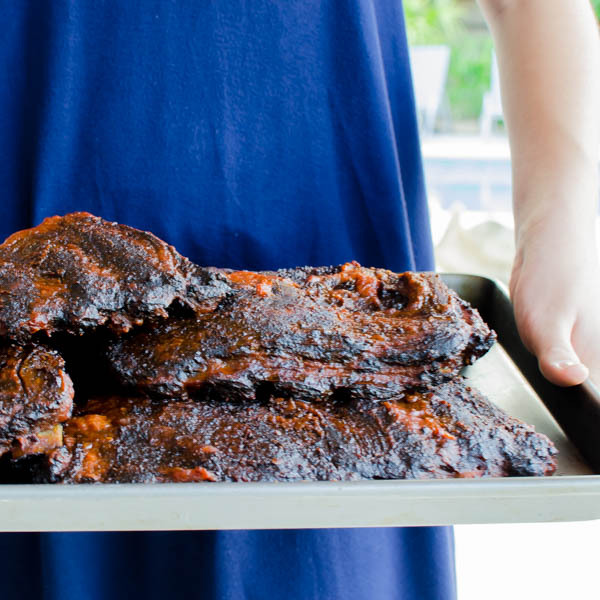 These ribs look absolutely incredible. I love that lacquered glaze. Definitely need to try this at home.